Obviously this is for charcoal not propane, but I heard this rumor that charcoal is the only way to grill if you’re looking for flavor – am I right about that? Having a tiny portable grill really gives you an advantage over grillers using those clunky tripod spaceships you see broken down on the side of the road all the time. They’re especially convenient if you’re a renter or are really pursuing a minimalist lifestyle. The bucket barbecue is a non-galvanized 2-3 gallon steel pail with some 3/4″ breathing holes pounded in a few inches from the bottom but above the charcoal fill level to allow our little food furnace to breathe properly. Finding a round griddle that fits your bucket snugly is the trickiest part of this project. It may be best to buy all the parts from the hardware store where you can try many different sized round grills to see what fits best. Be sure to use a handled bucket! 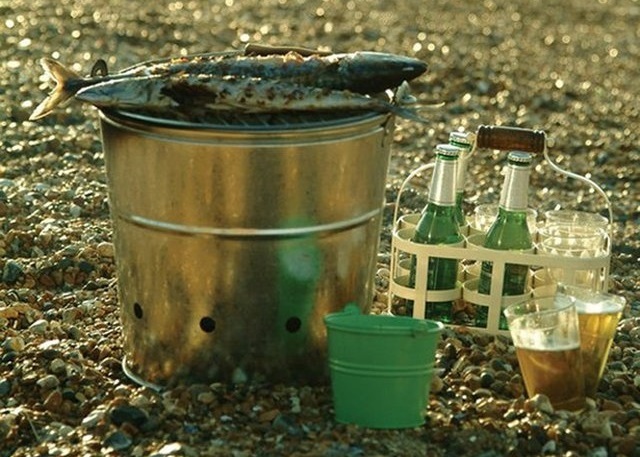 Ease of carrying around is a big advantage over those clunky old fashioned charcoal grills. It might make more sense to buy a pre-assembled bucket grill, since they’re fairly cheap and you know your griddle sizing will be absolutely perfect. But watch out because many of the grills advertised online require a campfire to work! 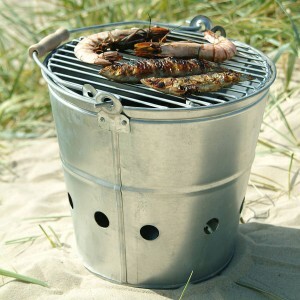 In my opinion that completely defeats the point of having a bucket grill. A self-contained unit means you can grill in way more places, including on your balcony. 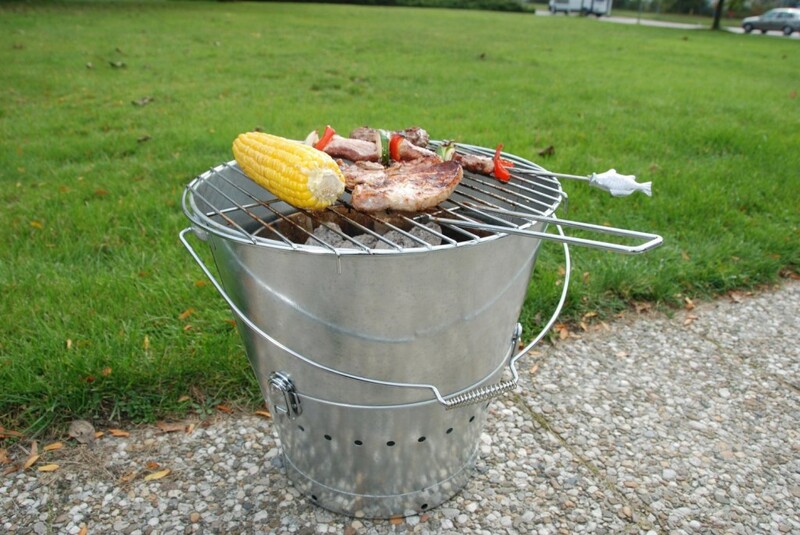 My favorite so far is this BBQ bucket from Esschert Design which these guys are using for a quick sidewalk grill party featuring corn and pork chops. It’s priced a little steep so I’m anxiously waiting for it to go on sale. Why NON-galvanized? what materials can you use for a diy charcoal grill? can you use regular clay pots? or ceramic pots? Galvanized steel releases fumes that are toxic under high temperatures. I think if you burn off the galvanizing before you use it to cook with you’ll be okay.